Is Dental Career Training Right For You? Find Out Now! Dental Assistant Recognition Week is a week long tribute to the commitment and dedication of dental assistants and their crucial role in the healthcare of our communities. This is a week being remembered and honored by the towns of Gilbert and Queen Creek and The American Institute of Dental Assisting of Mesa. Dental Assisting continues to diversify and expand. Whether working chair side with the dentist, taking x-rays, managing the business office or teaching, dental assistants are crucial to the success of the dental practice and for quality care of dental patients. , effort and selfless dedication to providing quality dental health care to the public. “It takes a special person to be a dental assistant” says Dr. Joseph C. Unger, chair of the American Dental Association’s Council of Dental Practice. Dental Assistants balance a variety of high priority responsibilities that benefit the patient, the dentist, other members of the dental team and the practice itself. The combination of clinical knowledge and people skills makes them an important asset to the dental practice”. The Dental Assistant Associations, Dental Assisting Schools, the U.S. Army and Air force dental clinics join dental offices everywhere in honoring dental assistants during this designated week. 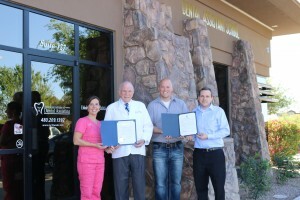 Dr. Hastings and staff present city proclamations for Dental Assistant Recognition week. The American Institute of Dental Assisting joins with the Town of Gilbert and Town of Queen Creek in dental assistant recognition week. These two towns have joined the American Institute of Dental Assisting along with the American Dental Assistants Association and the American Dental Association. They bring the importance of dental assistants to their communities. The Arizona Board of Private Post Secondary Education. © 2019 American Institute of Dental Assisting. All Rights Reserved. Website by Enrollment Resources.